Thanks to the generous support of Alabama Power, we are pleased to offer the Alabama Power Educational Initiative! 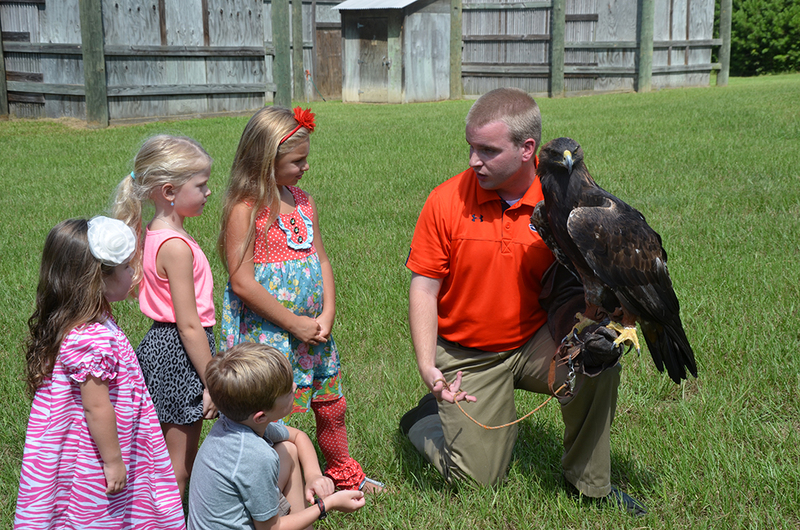 The Alabama Power Educational Initiative is an outdoor tour of the Southeastern Raptor Center’s permanent residents. This tour lasts approximately one hour, and can be booked for groups of 25 or less. To book an Alabama Power Educational Initiative, please click here; be sure to state your request for an Alabama Power Educational Initiative in the event description. The Education Unit of SRC will tailor presentations to meet your group’s objectives and curriculum. If you have a special interest or need, let us know. Our goal is to provide an informative, personalized presentation. We also encourage everyone to use the center as an educational resource. If your child is working on a report and needs information or photos, give us a call. We will be glad to help. The Southeastern Raptor Center is a non-profit organization and we do charge a fee to cover expenses and to aid in our education and conservation efforts. For more information or to arrange a program, call us at the number on the right or fill out our Raptor Program Request Form.